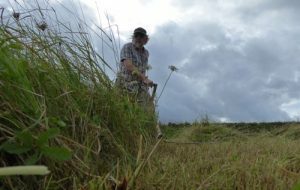 Whilst midsummer hay time in June/July is undoubtedly the most important mowing event in the scything calendar, there is important work for the scythe in meadows both in spring (which I wrote about in the new year) and the aftermath regrowth of late summer and Autumn. 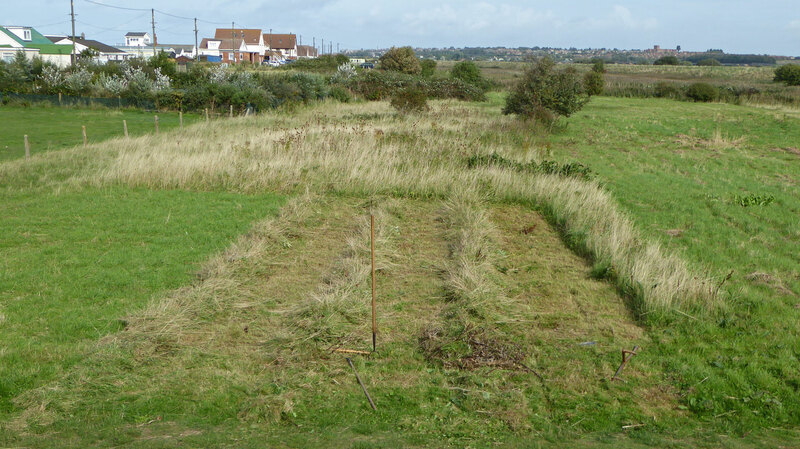 Mowing dry unproductive grassland at Heacham which only requires one cut per year to maintain balance for wildlife. Meadow and grassland which has regrown since the midsummer hay cut, or perhaps has missed a summer hay cut altogether, really does benefit from autumn mowing; it helps maintain or restore balance in grassland communities. Timing, number of cuts and type of mowing all have significant effects on structure and diversity of grassland. The dry grassland I manage at Heacham is a good illustration of this. In the overview above the larger area on the right is just topped once a year with a tractor mounted rotary mower and cuttings left. This is a basic holding operation only; it prevents bramble and scrub invasion and maintains some limited grassland structure. The central and area to the left has been mown by scythe with cuttings removed. This is the second year I have mown this patch, and already the structure is noticeably better; easier to mow, and looks to have more potential for diversity. Meadows which are cut for hay in the summer often produce a significant amount of regrowth through late summer and into Autumn. This ‘aftermath’ (as it is known to farmers) needs to be grazed back (traditionally) or mown to help prevent vigorous grasses and herbs dominating. This is particularly important on fertile soils and in damp summers. Meadows on moderately fertile soils which are not cut for hay in the summer and left uncut through to Autumn can suffer losses of quality and diversity. Taller more dominant plants have more time to grow unchecked smothering out low growing and less competitive herbs and grasses.The meadow pictured has been cut late (October) for several years. The sward is now becoming rank and dominated by more robust species such as Meadow crane’s-bill (Geranium pratense) and Knapweed (Centaurea nigra). Grassland which grows tall and lush into the autumn typically starts to collapse and die back leaving a mat of dead and rotting vegetation at its base. This blanket of grass smothers smaller plants and releases nutrients back to the soil rather than removing them with a hay crop. These nutrients plus the blanket of dead grass further encourages the dominance of coarser grasses and weeds. 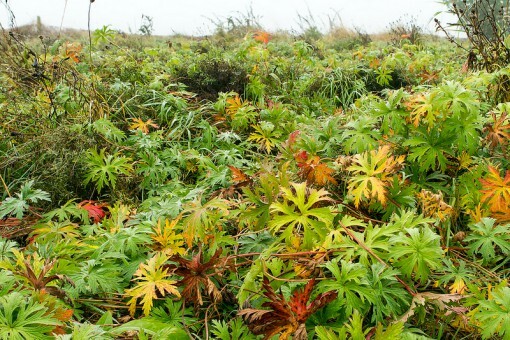 Studies have shown that areas that are left uncut for just one year can lose species. These losses are reversible with good grassland management but may take several years to put right. If autumn ground conditions allow cut back the standing vegetation at the first opportunity. Collect and remove the cuttings as best you can (not easy with a wet laid crop), this will remove some nutrients and limit the quantity of mulch laying on the meadow. Resume mowing management in spring taking a cut in early March where necessary. Ensure that you cut and remove hay from neglected sections of your meadow promptly in July over the next few years to reset the balance of fine and coarse components in the sward and to offset the build up of nutrients and thatch from the missed year. This entry was posted in Grassland management. Bookmark the permalink.